Create a masterpiece while putting the color on the paper, and leaving the wood on the tree. Made with the finest Hardmuth color, these high density, lacquer coated colored pencils have the smooth feel and excellent lay down properties desired by professional artists. 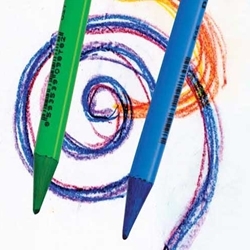 They may be used for drawing, illustrating and coloring, and they allow for a wide variety of unique effects. They outlast wood-cased pencils and fit regular sharpeners.